A day after Thanksgiving 2012, now known to many as Black Friday, four teenagers stopped at the Gate Gas Station in Jacksonville, Florida to buy some cigarettes and gum. They were playing their music loudly and looking forward to a night cruising around and doing what teenagers do. When Michael Dunn, who had parked beside them, asked them to turn down the music, one of the kids did. Then the 17-year-old Jordan Davis, sitting in the back seat, told his buddy to turn the music back up and bad-mouthed Dunn. Dunn took a gun from his glove compartment and fired into the car, killing Davis. He continued firing as the car reversed out of the lot. Ten shots were fired in total. 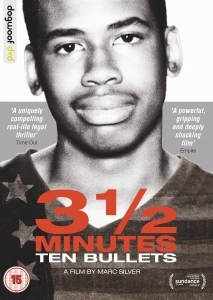 Marc Silver’s documentary 3½ Minutes, Ten Bullets (2015) intently follows the progress of the subsequent trial of Dunn who pleaded not guilty citing Florida’s Stand Your Ground Law – made already infamous by the acquittal of George Zimmerman for the slaying of Trayvon Martin that same year – which makes killing justifiable if the defendant is threatened or even feels or imagines themselves to be threatened. It also takes away any duty to retreat or de-escalate a situation, even though such action may diminish the threat. What emerges is a situation in which Dunn feels entitled to use deadly force on the slightest of provocations (though he also claimed Davis had a weapon). Another driver had passed by the space next to the boys, saying the loud music annoyed him and he “didn’t want to get into it”. In the convenience store Dunn joked with the clerk, “That’s my favourite song. I hope they turn it up.” That a mild annoyance, or even an intense annoyance, could be defused speaks volumes to the disproportionate use of deadly violence in the US. Silver drip feeds information, allowing his story to slowly emerge via emergency 911 calls, police interview tapes, interviews with relatives and friends, snippets of media coverage – which dub the incident the “Loud Music Killing”, as if it were the music that done it and not the gun or the law, and generous coverage of the trial. The latter is extremely important as we see that given the law the likelihood of the murder conviction seems remote at best. Not only can the defence characterise the victim as in some way culpable – a loud mouth thug which one friend rightly hears as “the new N-word”, it leans heavily on the fact that the burden of proof that Dunn wasn’t threatened rests with the prosecution. Both defence and the prosecutor are given time to make their case and the drama builds as Silver is sharp in catching the least flinch from Dunn, or even the officers of the court, a tensing of the shoulders in a black policeman, or the grief and worry etched on the face of the family members. They also have an opportunity to tell their stories of loss as Jordan’s mother Lucia falls on her religious faith to help her and father Ron struggles to maintain dignity sitting in the same room as the man who killed his son and may well walk free.